Never kid yourself, any time a company buys another, it’s a financial arrangement first, everything else is a distant second. From that standpoint, $26.2B is not a bad price to pay. It was a premium, over last week’s stock price (about 50% more or less), but LinkedIn’s stock had taken a dive earlier this year of about that much. It would have been much more expensive for Microsoft to buy them a year ago – so, it really is a bargain for them. Next, LinkedIn has a little over $3B in cash and about $1.5B in debt — this one is pretty big, it basically means, the “cost” of acquiring LinkedIn can probably be zero (or fully subsidized by LinkedIn’s cash). Everything else being equal, financially, the deal is solid. LinkedIn makes money and their biggest expense is their infrastructure and development – both of which Microsoft has plenty. The only problem would be top line – and LinkedIn grew that in 2015 – growing, cash and a workable cost structure – bonus points to Microsoft. 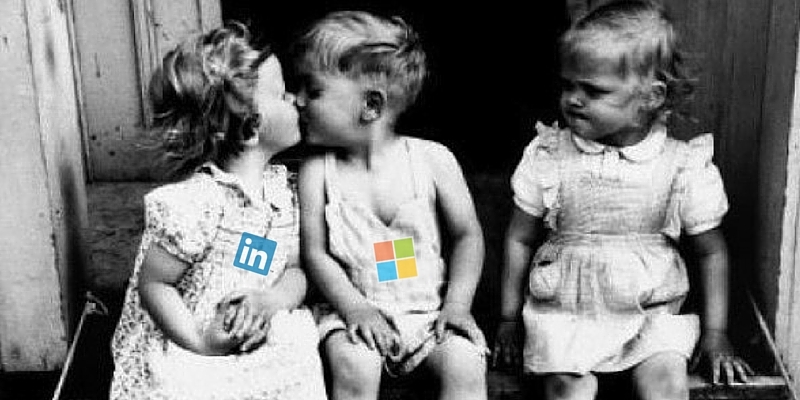 UPDATE: After reason opinions of Wall Street, the overall impression is Microsoft paid too much for LinkedIn. It’s based upon too many variables to explain. Basically, it boils down to this – LinkedIn doesn’t produce enough revenue, their user base isn’t growing, and some other weird and interesting facts. But, there was also a consensus, the available market (customer market) for both companies expanded, and that’s a good thing. Here’s what’s interesting about LinkedIn. They have a salesforce – as in real feet on the street. And, they are working within two business functions which have grown by leaps and bounds (from a budgetary standpoint) – HR and Marketing. Both are become huge consumers of technology and guess where Microsoft sits? Right there with the CIO, talking into his/her ear, now they have an (easier) entry into more HR and Marketing executive offices – talking about hiring solutions, advertising, and marketing data. Now, they have solutions sets, a new and growing area to exploit. Another win for Microsoft. Content (Articles, Updates, Sharing, Slideshare, News, etc) – advantage LinkedIn and Microsoft can leverage all that, along with the millions of new content created daily by their users. Profiles (basically an online repository of resumes) – advantage to LinkedIn again, I can’t even begin to imagine the amount of data that is tracked on everyone, and aggregate data is how Google become Google. Also, how easy would it be for Microsoft to pump a few dollars into the HR solutions available from both companies and make that single profile easily transportable – to client HR departments, to me as a user? Really, Microsoft would be a position to push the envelope a bit more than LinkedIn could by themselves. Risk is huge when looking at new “features and functions” – what was risky to LinkedIn, might now be so risky to Microsoft. Groups (love em or hate em – LinkedIn has them) – what if groups, which has lost functionality over the past few years, are resurrected by Microsoft and shoved over their Live version of SharePoint. Once again, thing about this – Slack has made huge inroads into the world that SharePoint occupied (within the corporate walls), what if, by leveraging 500M profiles, and a bit of programming magic, all of sudden you could do “Slack” type functions – but have those functions float in and out of my Employee life, Professional life, Organizational life, etc. SharePoint, Skpye, Communicator + LinkedIn profiles – the possibilities start to become staggering. Messaging (personally, one of the worst functions within LinkedIn) – advantage goes completely to Microsoft. Instant messaging – done. Email that works – done. Voice – done. Video – done. I mean, that one piece of the equation, shots LinkedIn into the stratosphere. I believe Microsoft is ahead of both Google and Facebook in this area, even if that isn’t true, this puts LinkedIn no worse than “on par” – which is SO much better than were they are today. Lynda.com was an interesting acquisition by LinkedIn, I didn’t know if it was one of the really brilliant moves that I just didn’t get or if it was a move by a company looking for their identity. BUT, now with Microsoft, that is an asset they can exploit – mainly, the ability to drive technology specific training (theirs and their partners) through an education channel that is already established. Also, Microsoft has the ability to extent their partnerships with world-class and leading higher education (on a global scale) – it opened up a world of possibilities for Microsoft, without having to establish the full back-end to make happen. Slideshare is a perfect match to Microsoft Live. The ability to upload a PowerPoint presentation, share it either privately (even behind company walls) or publicly is perfect. I’ve looked recently, and almost every tech conference (of any note) has a channel to share their presentations. And views are huge. I have one presentation I uploaded years ago, that still gets views. This is another function aspect of LinkedIn that is often forgotten by LinkedIn members, but if you publish content, Slideshare should be part of your overall content marketing strategy. UPDATE: Microsoft in their analyst call talked specifically about Lynda.com … look for them to exploit the functionality. This may be the keys to the kingdom. It costs a significant amount of money to host, manage, develop, release, operate, etc and so the infrastructure of a very large online website (and now with mobile – even bigger). We are talking global scale. So, guess what? Microsoft once again, had this one nailed. I can actually imagine the idea of this buyout came out of a sales meeting with LinkedIn … LinkedIn was looking to upgrade/transition/grow their footprint, Microsoft was one of the “partners” they were considering – and after they left one day, someone said “hell, why don’t we just buy them” (been in those meeting, it happens all the time). LinkedIn will no longer need to worry about “infrastructure” – Microsoft will worry about that. LinkedIn can leverage a huge ecosystem of programmers, operators, managers – without having to continually built up their ecosystem of internal/external people. It works, and even without putting pencil to paper, I can guarantee you, there will be a cost savings to what have been LinkedIn – even if the “numbers” published publicly don’t show it. UPDATE: The more I dig into this, the more this becomes interesting for Microsoft. First, it appears (although hard to tell), LinkedIn was doing the whole datacenter thing by itself (huge cost have no idea why) – build, implement, operate – they weren’t quite as global as I thought (but that’s where the info gets a bit out of focus). One other interesting tidbit – Microsoft owns lots of Transatlantic and Transpacific dark fiber. All-in-all, I think it was a great move for Microsoft. And probably a great move for LinkedIn for the long term. Both organizations have something which benefits the other – and there is the potential, this could spur some serious innovation that was only on the drawing board before (because LinkedIn didn’t have the resources and Microsoft didn’t have the “network”).